iRacing have always been looking at ways to improve their biggest series and some of the big issues have always surrounded qualifying. Major debate on how many people should get in, what parameters should surround it and in-championship squabbles have always been a thing, however iRacing is not one to give favouritism over one series or another. So when the NASCAR Peak Antifreeze Series document dropped this week, I took some time to decipher it and found a lot of trouble for the iRacing World Championship Grand Prix Series moving forward. 2018 February to November: iRacing will host the NASCAR iRacing Road to Pro series where the top 20 drivers in the Camping Trucks will advance to the NASCAR iRacing Pro Series. 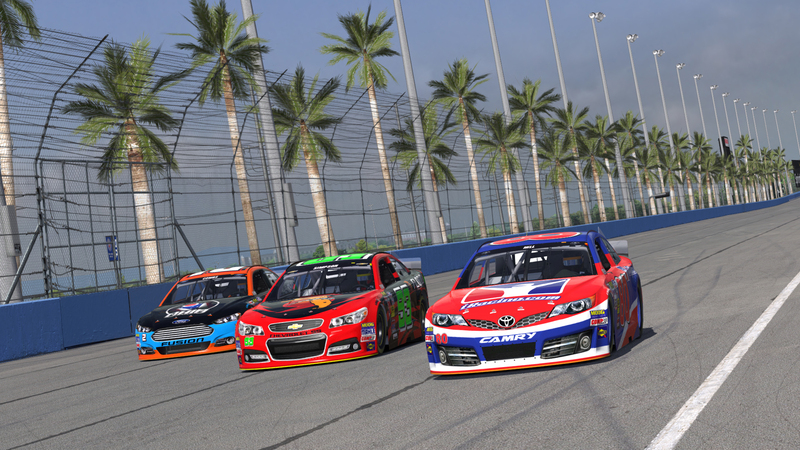 2018/19 November to January: iRacing will host the NASCAR iRacing Pro Series where the top 20 from the NASCAR iRacing Road to Pro series and the bottom 20 from the NASCAR Peak Antifreeze Series will race in the NASCAR Xfinity cars where the top 20 will gain a WCS licence for 2019. What you see is a series where you don’t use the car to race to qualify into the World Championships. While granted, I can see exactly the reasons of doing it, which are to put a progression based path similar to the real world and to fall more in line with traditional e-sports in a style similar to regional events to national events to world events, I see a system like that only being able to be put into NASCAR and almost impossible in the road category. NASCAR for one has every vehicle with a lot more similarity than road vehicles do and as such, the disparity of being quick in one vehicle to another is a lot smaller than what is the normal in road. While you will get people who are amazing in a Camping Truck and not brilliant in a Cup Car, It is very safe to say that at worst, you will be searching to fine tune the vehicle more rather than set it up in most occasions. Contrast that to how it would work in the open wheel sense, I cannot see a world where everybody has to qualify in a Skip Barber to get into a Formula Renault race with 39 rivals, 10 of which are already out due to not wanting to race the season and only then being able to drive the McLaren. All the while you are expected to be a fantastic Formula Renault driver as well as being a genius in the MP4/30 while driving week to week in the Skip Barber. Likewise in Blancpain terms, you shouldn’t have to qualify in the Porsche 911 when to get there, you have to drive either the Kia or the Mustang to then be a GT3 specialist. It just wouldn’t work and even if iRacing (finally) get around to finishing the Formula Renault 3.5, it still wouldn’t be a decision to make most of the community happy. For starters, the iRacing Grand Prix Series would be about as useful as trying to conduct open heart surgery with a rubber duck and iRacing would completely destroy any integrity that series has. Looking at some great drivers this year who have come from it, you have the likes of Ricardo Orozco, Michael Partington, Tommy Ostgaard, Joshua Rogers and many others who would not be in the position they are without the Grand Prix Series. Not only that but the best Skip Barber and Formula Renault drivers are just devoted specialists and not drivers who are looking for an active progression. Philippe Leybaert and Jouni Silvasti specialise in their specific cars alone and only Freek Schothorst has been the example to show a clear natural development up through the system into a McLaren drive with Boris Spoelstra almost being the second. I would even go as far to saying that a driver like Martijn Arnoldus in the Pro Mazda is not thinking about a WCS seat anytime soon. It would be the equivalent of going to the Pokemon World Championship to play VGC Doubles where to qualify, you won a Little Cup tournament. It is like reaching the LoL Worlds final by winning a single lane 1v1 tournament. It doesn’t make any sense. It would be a move that would stifle the development of new talent and leave iRacing in a vicious cycle of looking for new talent to change the top series, finding nobody in qualifying is making an impact and then changing everything to try and stop Martin Kronke from winning 280 trillion titles. It is an overly complicated idea which I think is more degenerate for the meta of iRacing on road than showcasing benefits and I think many of the points also ring true for the NPAS series too. I think NPAS will be a lot easier to implement in and I also think that the oval community would be more favourable towards it, however road iRacers are a very fickle bunch, and when you start messing around with a prize possession, you have to be very careful about what you do to it. Why is There Such a Push to Try and Claim Simracing as an Esport?